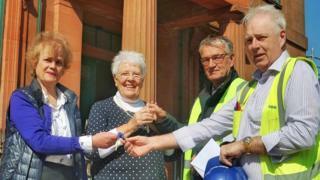 It paves the way for Moat Brae to open as a national centre for children's literature next year. Dame Barbara Kelly, who chairs the PPMBT, said: "This is a special moment for us - marking the completion of the major restoration and building work and the move to a whole new phase of the project. "We would like to thank the team from Balfour Beatty for the incredible job they have done in helping us give a new future to this wonderful building." A series of special events is planned later this year ahead of the full public opening. Once complete Moat Brae will feature a learning and education suite, café and shop, with the aim to "inspire visitors, to stimulate children's imagination and reveal the many stories the house has to tell".